"Business groups are adamant that the Resource Management Act needs a major overhaul - despite criticism that they are living in the past and ignoring improvements already being made..."
"The chief executive of the Ministry for the Environment told the Business Herald that he would fix the time it took to deal with problems plaguing the resource consent process within 12 months ... That was just over a year ago..."
"The demise of Project Aqua prompted alarm calls that New Zealand's bureaucratic hurdles were the death knell of any major project..."
The government plans to include a national interest clause in the Resource Management Act (RMA) to favour big projects. Finance Minister Michael Cullen told a business group that national benefits of projects should be weighed against local costs. He hopes to introduce a bill in Parliament in September to amend the Act. He said "There is no need for the act to be silent on such matters, and I am confident we can find a way of expressing some straightforward principles in this regard". This is Labour's answer to helping big projects that receive widespread public opposition, without gutting the RMA, as National and Act want. The Greens Party co-leader Jeanette Fitzsimons said the national interest clauses could be a big threat to the environment and public participation. "It means Project Aquas rather than 10 wind plants spread around the country serving the same purpose ... it means we will get bigger motorways carved through cities, rather than better public transport" she said. When Project Aqua, the proposed $1.2 billion hydroelectric canal diversion of the Waitaki River in North Otago, was scrapped by Meridian Energy, several reasons were cited for its failure, including problems with water rights, property acquisition, and anticipated difficulty with obtaining Resource Management Act consent. With disregard to the many problems that Project Aqua was facing, business groups and opposition government have jumped on the opportunity to blame the RMA process for large projects not getting approved. The RMA comes under fire from every direction - development interests complain it is too costly, takes too long, and is vulnerable to frivolous objection - environmental groups claim it is too oriented towards mitigating differences to avoid disapproval. In the case of Project Aqua, the threat of extensive RMA submissions apparently served opposition groups well. Criticism of the RMA comes again after changes to the Act last year, designed to speed up the process. And now again, the Associate Minister for the Environment, David Benson-Pope, is reviewing the process. Limited notification was introduced last year for projects with limited effects. Now, business groups are calling for objectors to be limited to only those who are directly impacted. Proponents of uncontrolled development see no reason why someone in Auckland or Waikikamookau should be able to object to a project in Waitaki, unless they have a direct commercial or property ownership interest. All citizens must retain the right to object to a significant development project. There is such a broad range of development applications under the RMA, it is impractical to apply a blanket rule that defines who is directly affected. The difference between the impact of a garage construction is obviously vastly different than a power station. The determination of "limited notification" is already a contentious issue, especially considering the inconsistency and the ability of some local councils managing the RMA process. State-owned Solid Energy's proposed Huntly coal mine was fast-tracked last year, immediately after a limited notification amendment to the RMA was enacted. This is by no means a project with limited impact - a hole covering 225ha and 100 metres deep will be dug, with expected impact from contaminated runoff into the Waikato River. Only Fish and Game, Department of Conservation, 17 adjoining landowners, and Tainui iwi were notified by Environment Waikato. The only submission was from Tainui. Emissions from a coal-burning power plant impact more than commercial and property interests in the vicinity. It directly affects every New Zealander, if not every world citizen, because of its impact on air quality and global warming. It can also be argued that every citizen of New Zealand has an interest in property that is in the public domain, such as a river or Crown Land. Every New Zealander deserved to have a say in the diversion of 72 percent of the Waitaki River's flow along a 60 km canal, since it is the country's largest braided river, eighth longest river, and the South Island's fifth largest. The river is after all a 209 km strip of public property. 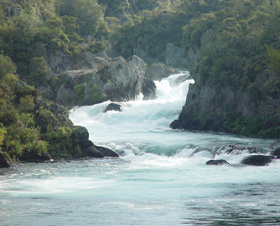 Aratiatia Rapids, Waikato River in 2003 during a brief reduced flow period. This most picturesque stretch of New Zealand's longest river, with the most spectacular set of rapids, went completely dry in 1964. All of the Waikato River's flow which is the largest in New Zealand, was diverted to pass through the Aratiatia hydroelectric station located 17km below Lake Taupo. As with many public works projects of the time, the government forced the Aratiatia project through. Without the Resource Management Act there was no process for citizen objection. With the failure of Project Aqua, it seems unlikely there will ever be another major hydroelectric project in New Zealand. Hydro development like Aratiatia would undoubtedly not succeed in the current resource consent process. In order to satisfy the public outcry, a water flow of 90,000 liters per second is sent down the original riverbed for a brief period at set times three or four times a day. Visitors can see how things once were, but it is not quite the real thing. 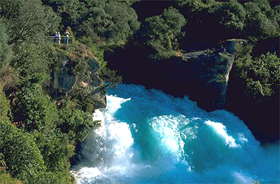 Up to 220,000 liters per second pass through Huka Falls just a few kilometres upstream. Write to the Associate Minister for the Environment, David Benson-Pope, to urge retention of the public's right to make submissions on Resource Management Act consents. No postage stamp is needed if mailed in New Zealand. Business groups are also calling for RMA changes to allow developers the option to skip the local government step, and go straight to Environment Court with a direct referral, when they believe they will end up there anyway. Direct referral would eliminate public submissions in local government managed RMA procedures, forcing public objectors to go before the Environment Court. Many objectors drop out of the process when it gets to the Court because of the additional cost of giving evidence. Keeping an application completely within the Environment Court would sidestep the basic principal of the RMA, to get public input. Many problems get resolved as a result of objections, and it is helpful if this is achieved before reaching court, and that public input at the lower level carries over.